What a delightful day we had! Big Oops! The bag with our cooking gear was still at home. the Pure Texan team will be back in action at the San Antonio Elks Lodge this weekend. Alan & Susan Dean will be giving out samples of their popular Pure Texan Chili. Pure Texan Chili is now available at Texcetera and Whittinton's Jerky in Johnson City. 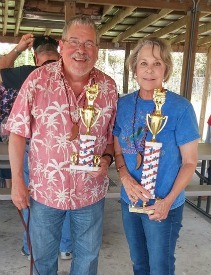 The public is invited to participate in the "Not-Your Ordinary Chili Contest"
Alan and Susan celebrated their 40th anniversary by taking First Place Chili and Second Place Chili in Jacksonville, Florida at the American Pride Chili Cookoff.